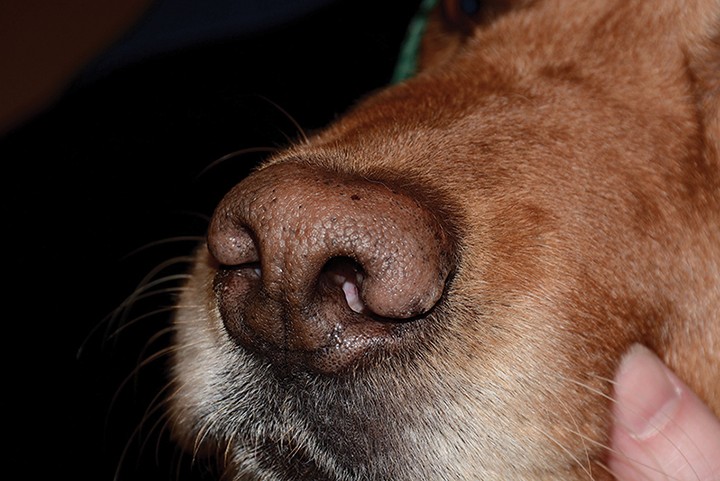 Many pet owners believe a dog’s nose is an indicator of health status and will thus seek veterinary care for any change in coloration or texture or if lesions develop. 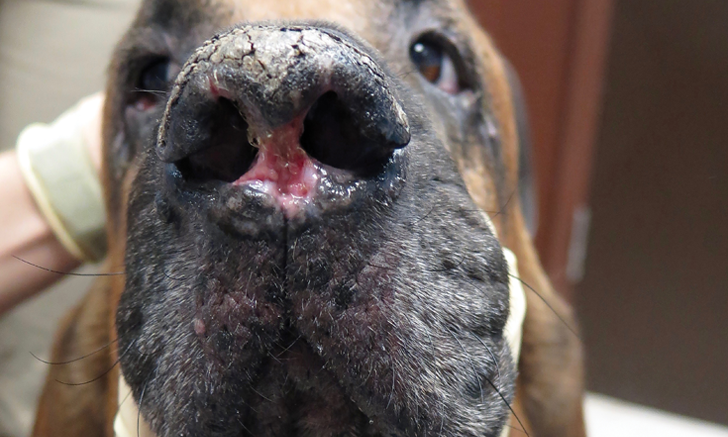 Following is a discussion of the more common and breed-specific conditions that present with lesions primarily affecting the nasal planum. Idiopathic nasal depigmentation occurs when a nasal planum that was pigmented at birth later loses its color. The condition may wax and wane, but only the nose is affected, with no changes in the nasal planum architecture (ie, the cobblestone-like appearance is preserved [Figure 1]). 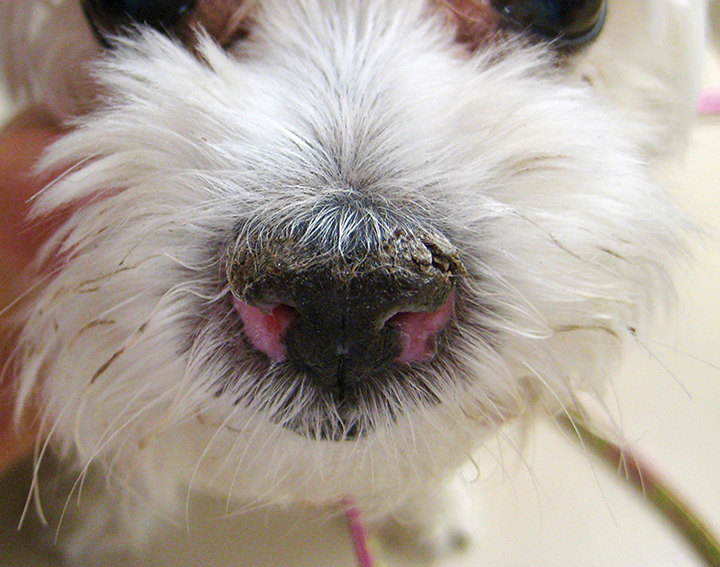 Other noninflammatory depigmenting conditions include snow nose and Dudley nose. Snow nose is a seasonal decrease in nasal pigmentation commonly observed in Arctic breeds and retrievers.1 Dogs with Dudley nose have no nasal pigmentation and are generally affected from birth. Both are cosmetic defects and do not warrant further investigation or therapy. 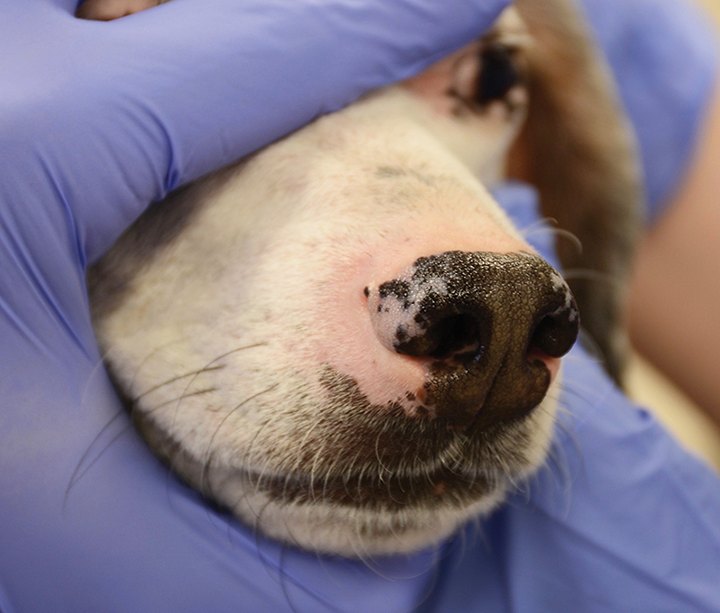 FIGURE 1 Idiopathic nasal depigmentation in a 6-year-old neutered male Labrador retriever. Depigmentation is confined to the nasal planum. The cobblestone-like architecture is preserved. 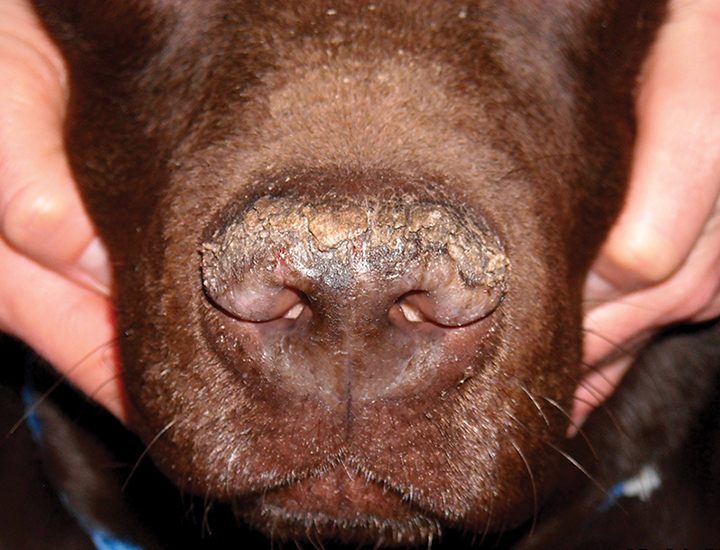 Nasal parakeratosis of Labrador retrievers is a familial dermatosis characterized by the accumulation of adherent keratin debris along the dorsal nasal planum with secondary crusting, fissures, erosions, and depigmentation (Figure 3). It typically becomes apparent at an early age (ie, 6-12 months). Lesions may wax and wane but are limited to the nasal planum. Although this is an incurable, lifelong condition, prognosis is good, and early management with frequent application of softening agents (eg, petroleum jelly, propylene glycol) may help prevent severe fissuring. 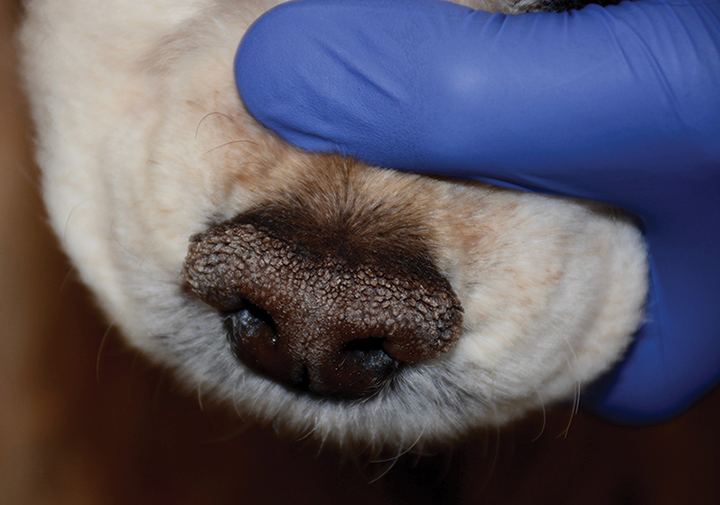 FIGURE 4 Idiopathic nasal hyperkeratosis in a 10-year-old spayed American cocker spaniel. Excessive keratin can be seen forming frond- or finger-like projections without signs of inflammation. Mucocutaneous pyoderma is a bacterial infection that affects the mucocutaneous junctions and nasal planum. Similar to superficial bacterial folliculitis, the infection is normally secondary to an underlying condition (eg, allergic hypersensitivity, endocrinopathy). Lesions may be symmetric and characterized by erythema, crusting, erosions, depigmentation, and discomfort (Figure 5) and are most commonly found along the lip margins (especially the commissures) and nasal planum. Treatment consists of systemic administration of a first-tier antimicrobial (ie, cephalexin, clindamycin, amoxicillin–clavulanic acid) for a minimum of 3 weeks.3 Prognosis is good if the underlying condition can be identified and managed. Dermatophytosis (ie, ringworm) may mimic an autoimmune condition such as pemphigus foliaceus, with the nasal planum and/or face solely affected; however, this presentation is uncommon and is typically seen with infections caused by Trichophyton mentagrophytes, which is acquired from direct or indirect contact with rodents. Dermatophytosis is typically characterized by crusting and depigmentation of the nasal planum, along with folliculitis and furunculosis of facial skin when affected (Figure 6). Treatment should include systemic administration of a triazole derivative or terbinafine. Prognosis is good if the point source can be eliminated to prevent recurrence. 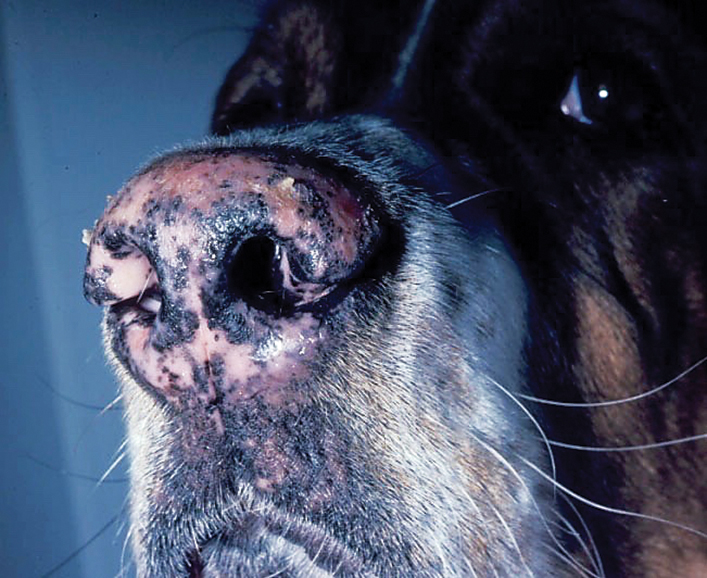 Deep mycotic infections (eg, blastomycosis, histoplasmosis) may also present with lesions initially confined to the nasal planum. Depigmentation, swelling, ulceration, and destruction or deformation of the nasal planum are typically present (Figure 7). These conditions have a geographic distribution within the United States, where the infective spores are acquired from the environment via inhalation or inoculation. Prognosis varies from poor to guarded, as many cases have systemic involvement at the time of diagnosis and require extended antifungal treatment regimens with a high occurrence of disease relapse. Pemphigus foliaceus in dogs occurs as a result of autoantibodies produced against a keratinocyte adhesion molecule that causes cells to detach from one another in the outer layers of the epidermis.4 The disease typically occurs in middle-aged animals, with breed predispositions observed in Akitas, chow chows, Doberman pinchers, dachshunds, and cocker spaniels. The cause of pemphigus foliaceus is idiopathic in most cases, but cases that occur secondary to drug reactions (eg, antimicrobials, topical preventives) or vaccination or as sequelae to a systemic inflammatory condition have been reported. Lesions consist of pustules, crusts, erosions, and depigmentation and are commonly found along the nasal planum, on the inner aspect of the ears, and on the foot pads (Figure 8).5 Treatment typically involves systemic immunosuppressive medications tapered to the lowest dose required to control disease. Care should be taken not to taper medications too soon or too quickly, as this can lead to clinical relapses and subsequently overall greater cumulative doses. Prognosis varies from guarded to poor and is primarily dependent on the patient’s ability to tolerate the medications. Discoid lupus erythematosus is a relatively benign condition. Although the exact pathogenesis of the disease is not known, it is known to be photoaggravated. The nasal planum is the primary location affected, but lesions may also be noted at the periocular, foot pad, perianal, and ear regions. Lesions consist of erythema, depigmentation, loss of the normal nasal planum architecture, erosions, ulceration, and crusting beginning along the dorsal portion of the nasal planum (Figure 9). Treatment protocols vary, with prognosis being fair to good. A key to therapeutic success is limiting or protecting the patient from excessive UV light exposure. Uveodermatologic syndrome is the result of an autoimmune process directed against components of melanocytes. Although the condition may be seen in multiple breeds, it is most commonly reported in Akitas, in which a genetic basis has been proposed.6 The disease process results in granulomatous panuveitis and leukoderma, which may progress to severe crusting and ulcerations (Figure 10); of note, leukoderma may be present in multiple locations and not limited to the nasal planum. Overall, prognosis is fair, and therapy should be primarily focused on the eyes to prevent ocular complications. Dermal arteritis of the nasal philtrum is a rare condition most commonly seen in Saint Bernards and characterized by a distinct linear or circular ulcer on the central portion of the nasal planum along the philtrum (Figure 11). The condition can cause recurrent bleeding episodes, which may require immediate intervention. The exact etiology and whether a genetic basis exists are unknown.7 Prognosis is fair, with topical tacrolimus providing an alternative to systemic treatment options.7 Lifelong treatment is required, and permanent scarring in the lesion area is likely. Most conditions that affect the nasal planum will present with clinical similarities. Appropriate diagnosis of nasal planum disease requires understanding the conditions that can occur, understanding patient signalment, and ruling out mucocutaneous pyoderma as a primary differential. Once the noninflammatory depigmenting, hyperkeratotic, and infectious conditions have been ruled out, biopsy is typically required for definitive diagnosis. Because it is beyond the scope of this article to thoroughly cover all therapy options for the presented conditions, readers are encouraged to consult additional references (see Suggested Reading) for a more complete discussion regarding disease-specific therapeutic considerations. Miller WH, Griffin CE, Campbell KL. Pigmentary abnormalities. Muller and Kirk’s Small Animal Dermatology. 7th ed. St. Louis, MO: Elsevier Mosby; 2013:618-629. Catarino M, Combarros-Garcia D, Mimouni P, Pressanti C, Cadiergues MC. 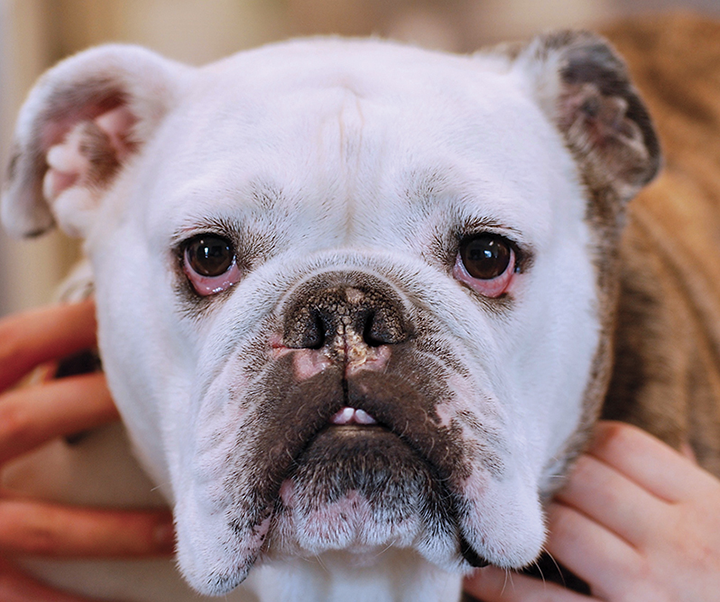 Control of canine idiopathic nasal hyperkeratosis with natural skin restorative balm: a randomized double-blind placebo-controlled study. Vet Dermatol. 2018;29(2):134-e53. Hillier A, Lloyd DH, Weese JS, et al. 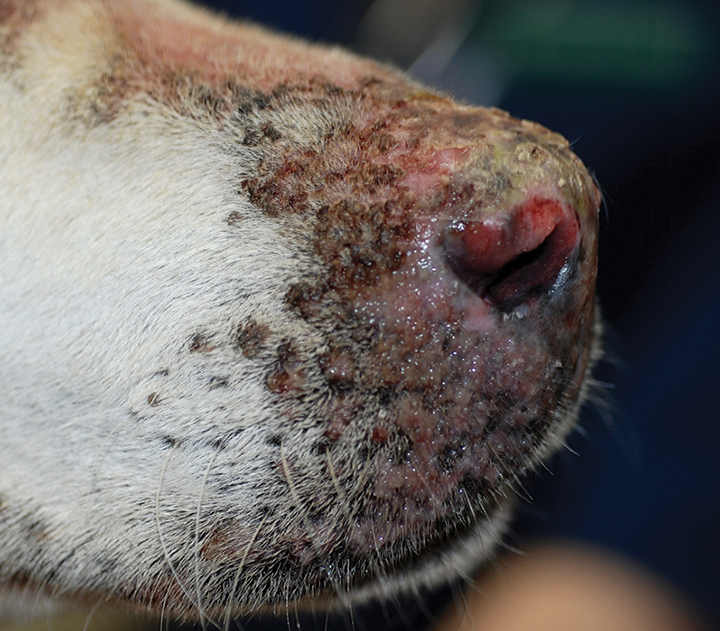 Guidelines for the diagnosis and antimicrobial therapy of canine superficial bacterial folliculitis (Antimicrobial Guidelines Working Group of the International Society for Companion Animal Infectious Diseases). Vet Dermatol. 2014;25(3):163-175. Bizikova P, Dean GA, Hashimoto, Olivry T. Cloning and establishment of canine desmocollin-1 as a major autoantigen in canine pemphigus foliaceus. Vet Immunol Immunopathol. 2012;149(3-4):197-207. Mueller RS, Krebs I, Power HT, Fieseler KV. 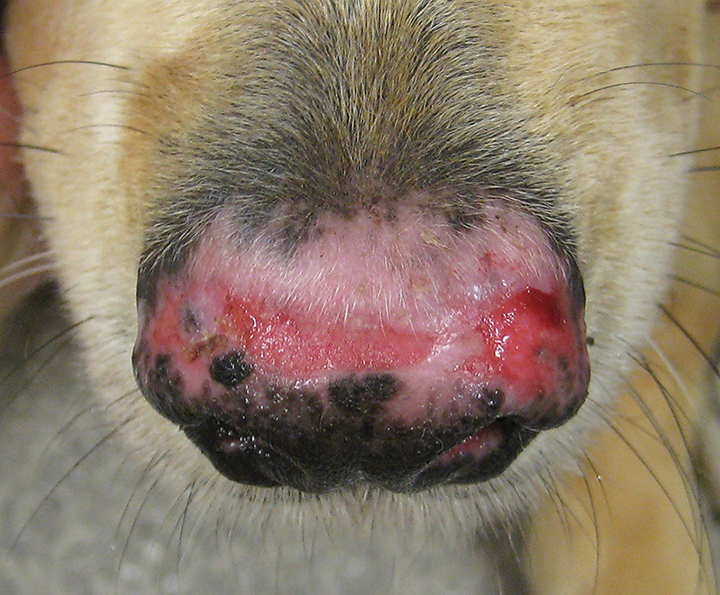 Pemphigus foliaceus in 91 dogs. J Am Anim Hosp Assoc. 2006;42(3):189-196. Angles JM, Famula TR, Pedersen NC. 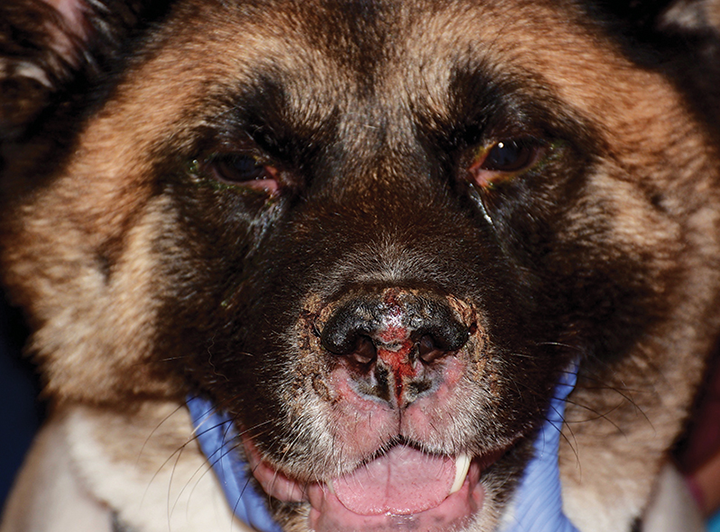 Uveodermatologic (VKH-like) syndrome in American Akita dogs is associated with an increased frequency of DQA1*00201. Tissue Antigens. 2005;66(6):656-665. 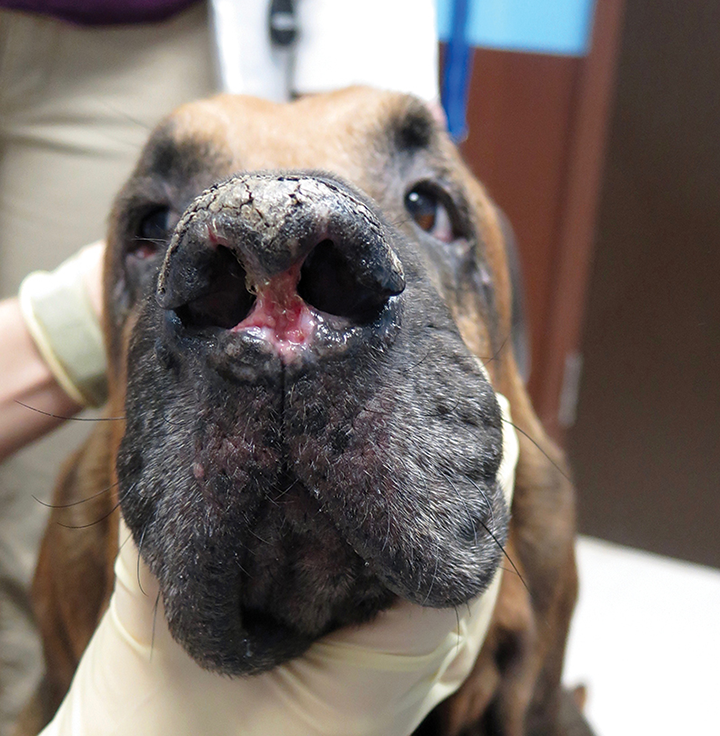 Banovic F, Jerry C, Howerth E. Tacrolimus therapy for dermal arteritis of the nasal philtrum refractory to surgery and anti-inflammatory therapy (doxycycline/niacinamide and topical fluocinolone) in a dog. Vet Dermatol. 2018;29(1):85-e35. Santoro D, Marsella R, Hernandez J. Investigation on the association between atopic dermatitis and the development of mycosis fungoides in dogs: a retrospective case-control study. Vet Dermatol. 2007;18(2):101-106. Fontaine J, Heimann M, Day MJ. 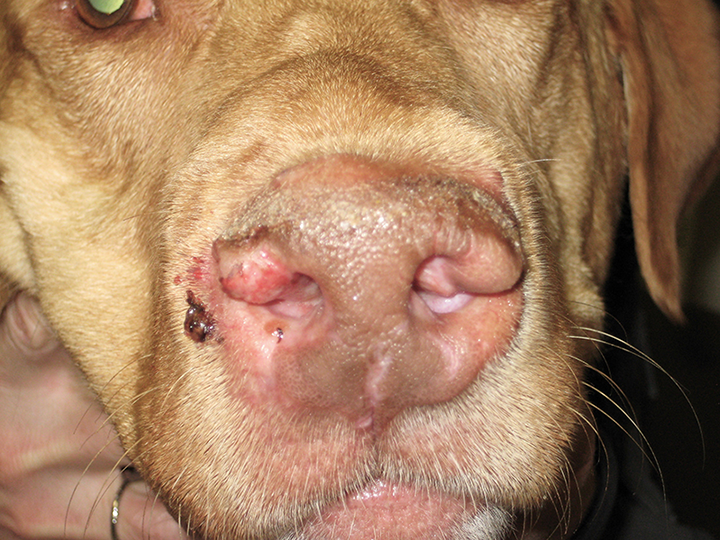 Canine cutaneous epitheliotrophic T-cell lymphoma: a review of 30 cases. Vet Dermatol. 2010;21(3):267-275.